Sometimes starting slow is the best way to start. It allows you to grow comfortable with what you are working on. In my case it is my only option but at this point I do not mind it. 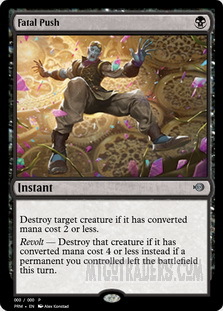 Modern is at a good place it seems. There are established decks and archetypes but still plenty of room for innovation and rogue builds. I know that at this point I cannot jump into the competitive end of the pool. My collection is abysmal and I have no idea what strategy I even want to play at this point. I started small and started with something I am very familiar with. What did I choose? Mono White. There was one list that I gained my interest. I made a few changes due to budget and it was there that I began my journey. The main goal is to stall long enough that you can start Forecasting Proclamation of Rebirth . The cool part is that there are multiple 1 drops that you can return and also search with via Ranger of Eos . Let’s take a look at the options. Weathered Wayfarer - He works well with the various lands that you have in your deck. 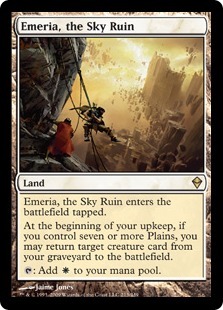 He can search up some land destruction in the form of Ghost Quarter or Field of Ruin or the other utility lands like Mistveil Plains or Emeria, the Sky Ruin . The recursion is a very important theme to this deck and having lands that help with the process makes the deck very stable. 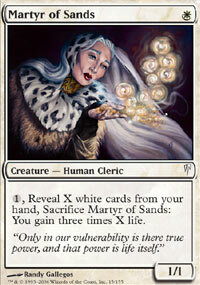 Martyr of Sands - This is the other namesake card of the deck. It helps you gain a ton of life so that you can stay alive and get to the end game. It also turns our next 1 drop into a powerhouse. 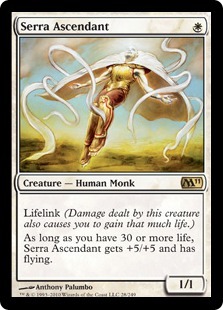 Serra Ascendant - A 1 mana 1/1 does not seem too impressive but when you have over 30 life and it is a 6/6 flyer, it gets a lot better. 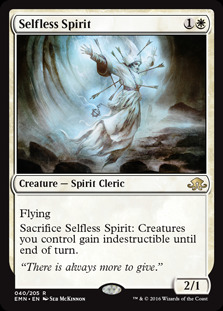 Gaining the life is not hard when you can recur Martyr and even though this card is not as strong with Fatal Push everywhere, it can be brought back into play with Proclamation of Rebirth . They can only kill it so often and once you get into the late game you have nothing to worry about. 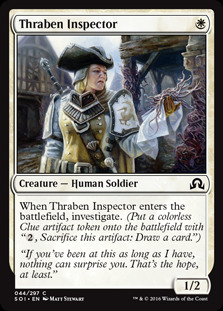 Thraben Inspector - A mini card drawing engine when needed and just a great early blocker. I have loved this card since it was first printed and like that it shows up in Modern. 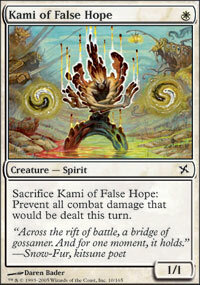 Kami of False Hope - Great for a one-shot fog, and far better when you are recurring it and preventing your opponent from doing anything worthwhile. The rest of the deck is really there to support the 1 drops. I know that seems strange but when you can win on the back of a 1 mana 6/6 flyer you need a way to make sure that creature sticks around or you can have access to it. 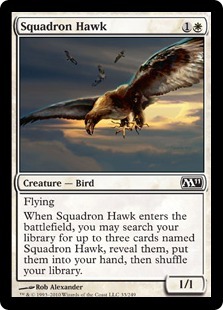 Squadron Hawk - is a way to fill your hand with white cards so you can gain mass amounts of life with your Martyr. 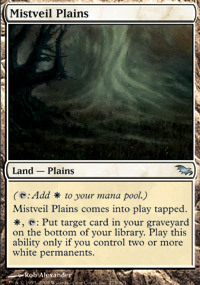 It also thins out your deck and works well with Mistveil Plains, making sure you always have something to search up. 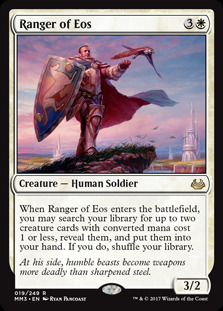 Ranger of Eos - I mentioned earlier. 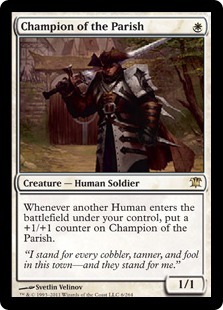 I have loved this card since it was in Standard but in Modern he can find so much more. He usually is looking for the Ascendant and Martyr but there are times he will look for other creatures depending on your need. I have search up Kami and even a Thraben Inspector many times. Archangel Avacyn - Was a card I saw in a few different lists and I actually like her in this deck. There are times where she can be an alternate win con and another board wipe if needed. You have plenty of creatures that die and even a few that can self-sacrifice. Who knows maybe Selfless Spirit can show up in this deck. 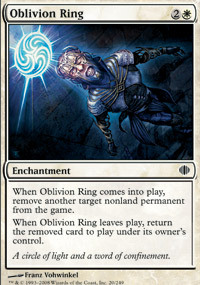 It has main board answers to enchantments and artifacts with Oblivion Ring and even Austere Command . 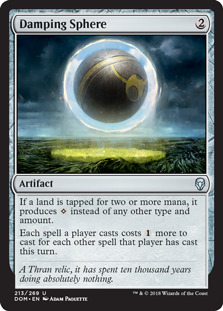 Crucible of Worlds - is a "fun of" that helps you recur some land destruction or get back important lands like Emeria or Mistveil. 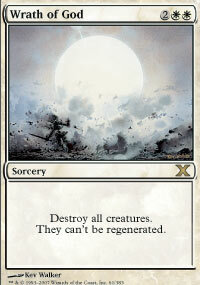 Also helps you use the lands that you had to cycle earlier. Finally, there is Proclamation of Rebirth . 2 copies seem to me plenty and there are times where you do not even need to forecast it. Just casting it to get a Martyr and 2 Ascendants back into play can close the game out very quickly. The recursion can feel very good. Over all this deck is a lot of fun to play but because this is a budget version it is lacking a bit. 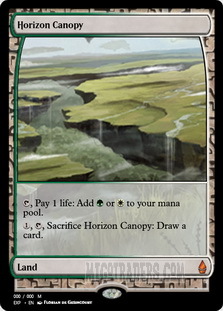 Once I continue to build my collection with the white staples or even better utility lands like Horizon Canopy , I feel like the deck can be a lot stronger. I saw it 5-0 a few leagues and as usual in Modern any deck can be successful if the pilot knows the meta and how to pilot the deck. 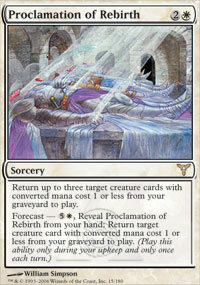 Next, I want to post another list I am working on that goes back to my roots on Magic Online. I have probably built and played this deck more than any other in my time on MTGO. I tried splashing black and making it more aggressive with an all human build featuring Thalia's Lieutenant and Champion of the Parish . However, I always come back to something similar to this list. As you can see it is not really fancy or special. Play creatures and gain life. Try to win with your big creatures or swarm with tokens and weenies. The sideboard could use some work but that will come as my collection increases. 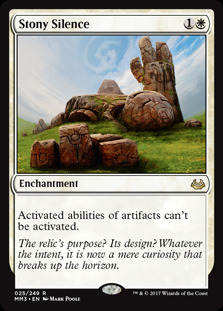 Cards like Stony Silence are a must with all the artifact based decks in Modern. 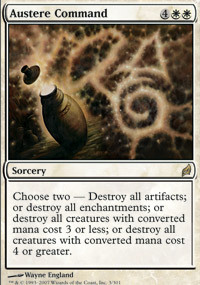 Damping Sphere is a great sideboard card that easily fits into these mono colored decks to help against Tron and Storm. 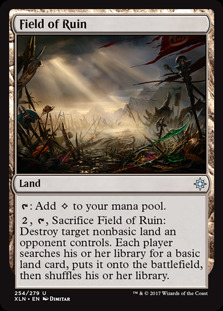 I also think that Suppression Field could see some play in the board or even the main. 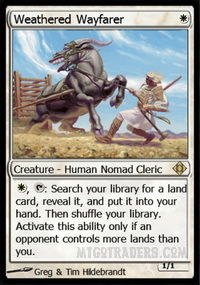 I used to use that quite effectively against most opponents because even fetch lands and Planeswalkers are affected by it. It felt good to play Modern again and as I build up and test other decks I am sure I will enjoy it even more. I may start to brew again while I wait to play a tier 1 deck but either way I am committed to having fun. Thank you all for your support and I hope to writing and playing a lot more! Nice article, thanks for writing. Would you consider an extra Proc in the board, just because it is so busted against any matchup packing removal. Yeah it would not be terrible. I am still testing out the deck and trying a new version now that I will show off soon. There can be a lot of options for this type of deck. Obviously I'm not surprised that you've gone back to some old favorites. Luckily, there are some metas that SS completly crushes. The Tron hate in the board is certainly warranted. I do want to point out that Flagstones of Trokair really doesn't do anything other than make you "weaker" to Blood Moon. 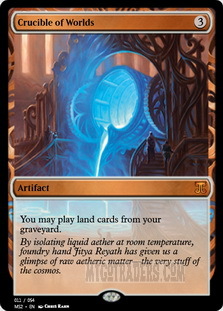 The only deck that it might be useful against is Todd Anderson's GW Value Town, otherwise, no other deck would really waste a Field of Ruin or Ghost Quarter on it. 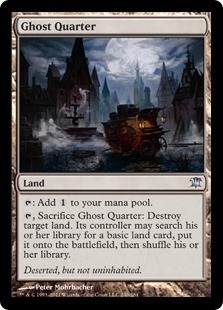 I know you could Ghost Quarter your own lands, but is it really worth it? Flagstones is an interesting choice. It has anti-synergies with Emeria which pushes it off the radar for me. What is your feedback about Flagstones?